﻿ Using Stones for Personal Growth. Snowflake Obsidian: Consistency. Snowflake Obsidian is a black volcanic glassy rock containing spherulite inclusions of a white or grayish-white mineral that resembles snowflakes on its surface. Mined in Utah, it is a favorite cabochon stone of rock hounds because of its translucent patterns. 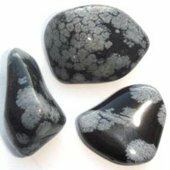 Snowflake Obsidian acts on the Inner Being to strengthen Consistency. Consistency is the emotional steadiness that comes from being a levelheaded, balanced and even-tempered person. It is the ability to keep your emotions on a steady course, on an even keel, so that you don't have wild mood swings. It is the ability to rein in your emotions, especially in stressful situations, and keep them from getting out of control. And it is also the ability to be your best for those around you, on an ongoing basis. If you are a consistent person, you don't have a lot of severe ups and downs. You usually behave in the same manner under the same circumstances, and you don't fluctuate drastically in your motivations and behavior. You behave predictably to people who know you well, because you always act in a manner that reflects who you really are. Your emotional composure keeps you from suddenly flitting from one way of being to another, or from one attitude to another. And if you are going to change, you let those around you know by doing it in a gentle and gradual way. Consistency has both a doing side and a knowing side. The doing side is operating your life in a consistent and even-tempered way. The knowing side is recognizing what is consistent, both in yourself and others. It is being able to see consistency in people so that you know who you can count on to be consistent. The doing and knowing side of consistency work together as two sides of the same duality. This means that as you develop the ability to recognize consistency in people, you also become a more consistent person yourself. When you know that someone close to you is a consistent person, you feel comfortable and relaxed with him. You know you can be yourself around him because you don't have to worry about him flying off the handle, for example, if you should happen to say the wrong thing. You have faith in his stability, and you know you can count on him to be steady, centered and emotionally unruffled almost all the time. You also know that on the rare occasions when he does get emotionally upset, there is always a good reason for it. If you have trouble being consistent, you spend a significant amount of time not operating at your best. You tend to be erratic and changeable in your behavior, and your life is sometimes chaotic and out of control. You find it difficult to hold on to relationships because you can be loving and demonstrative one day, and cold and uncaring the next. Others can't possibly know what to expect from you because you never do things the same way twice. Also, you often respond in ways that you yourself can't predict, and this produces a great deal of confusion in your life. If you want to become a more consistent person, look at changing your perspective in a couple of areas. Become more aware of people's emotional limitations, including your own, and become familiar with the kinds of things people find emotionally difficult to handle. Learn to evaluate people's composure and emotional stability, including your own, in unusual or surprising situations. Work at maintaining your own emotional composure in difficult situations, including situations where you get caught off guard. Learning to expect the unexpected makes you a more consistent person because it helps you know how to handle surprises. You can also add to the consistency of your thoughts and ideas by learning to build individual pieces of knowledge into a larger structure. There is an internal consistency that comes from having pieces fit and work well together in a way that makes sense. For example, if you try to put together a logical argument, but something about it is inconsistent and doesn't make sense, the whole argument is invalid because it is not cohesive. Whenever you build anything, whether it is a logical argument or a physical house, each piece must fit with everything that has been put in place before. Learning to integrate things into a functioning cohesive system enhances consistency. To increase your level of consistency, use a little self-discipline to keep yourself organized. Being organized puts you in control of your own affairs and gives you a great deal of stability as a person. It allows you to operate more consistently because it keeps your life running smoothly and prevents things from getting out of control.